This is a Gold Eleven compartment heavy duty plastic specially made for Gujarati and Indian parties with lot of dishes of tasty food. 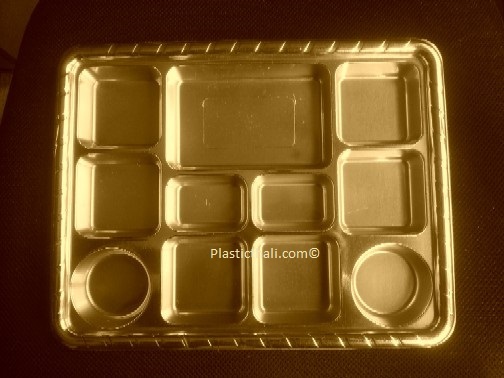 These Gold Eleven compartment plates are also called 11 section plates or disposable thaalis. These plates are like disposable plastic thalis. They have Eleven deep compartment and are made of heavy duty plastic to hold all that food that can be put in all of the Eleven compartments. These Eleven section disposable plastic plates are custom designed for Asian and Indian food specially Gujarati food that has lot of dishes. They come in pack of 50.